When compared to today's notebook that looks cheerful with colorful, Lenovo ThinkPad X200 seems very conservative, serious. The design is typical of a ThinkPad with a rectangular body and tapered corners, and a black doff. The lenovo letters in small letters appear on the left side of the notebook cover. On the other side, the ThinkPad label with a red dot on the letter 'I' with a slope of about 30o offset the lenovo label. An Energy Star sticker also sticks to the cover, near the right hinge. Somewhat to the middle - still near the hinges - lined three LEDs (hard drive, power supply, standby). Sturdy ThinkPad X200 hinges look different from the hinge on the majority of other notebooks. Made of steel, the hinge implies the robustness of the ThinkPad X200. Eits, do not rush open the cover of this notebook. Because the cover is locked. Slide and hold first the key, aka the slider switch, which is on the front while lifting the cover to open this notebook. Well so the outstretched LCD will feel steady hinge in keeping the LCD does not waver. Oh yes this hinge also allows LCD to sleep up to 180 degrees, which is very useful for those who often have to make presentations using the projector. Steady hinge in maintaining the LCD is also felt when we use the ThinkPad X200 in a car that occasionally shook due to a less smooth road, or the existence of a sleeping policeman. Loh, instead of shocks and collisions can damage data that is entrenched in the hard drive? Take it easy, ThinkPad X200 is tough. Harddisk is protected by APS system (active protection system). What is APS? APS is an on-board software that together with an embedded accelerator will detect shock and vibration, then move the read / write head of the hard drive so that the data is not corrupted or corrupted. It resembles the work of airbags on the car. Protection on the ThinkPad X200 is not just for hard drives and hinges, but its casing. Understandably the casing is made of strong magnesium alloy. When the casing we tap, it will sound as if there is a cavity between the LCD panel. This is due to the use of a roll cage between the LCD panel and the outer casing. Roll cage is made of carbon fiber monocoque - the material used in airplanes and racing cars - serves as a protector when the notebook is dropped. Although strong, its use does not make the notebook weighs heavier. Solid Port Before we start to search the inside of the ThinkPad X200, let's close the cover first. We first review the physical outside of this dashing notebook. We start from the left side. On the left there is no intermediate space. From the front to the back is fully charged, starting with an ExpressCard slot which is at the bottom occupied by a wireless switch and a USB port, LAN port, VGA-out port, a USB port and a ventilation grille, to a DC-in jack colored yellow light. Contrary to the solid left side of the port, the back of the unit looks quiet, clean from any port. What about the right side? The right side is also solid. In the back - near the hinge - present a Security Lock hole. After that (towards the front) appears a compartment that is locked with a screw on the bottom of the unit. This compartment is the location of the hard drive. In the front of the closed compartment it is a RJ-11 jack, microphone jack, headphone jack, and one USB port. We move to the front of the unit. On the right front side the memory card slot appears. This slot embraces the spring system, so the entire body of the SD / MMC memory card will be swallowed in. To remove the card, push the end of the card body, and the card will appear, ready for us to unplug it. To the left of this memory card slot is a slider of the notebook lock switch. There's nothing else on that front. Bottom: Loaded Holes Now let's turn this unit around. The bottom of a compact notebook is visibly laden with ventilation holes. The holes are on the right, left, and front. Notice the holes in the lower right side. There is one special rectangular hole there. This is the drainage hole for liquids that accidentally spill the keyboard. Four rubber pads are visible on all four corners of the unit. This rubber pad causes the position of the notebook to not dock with the surface where it is laid, but a little punctuated, especially in the back. This also provides a liquid spillage space that spills over the keyboard. In addition to the ventilation and rubber feet, at the bottom there is a connector to connect the notebook with the docking station. If the X200 UltraBase is optional, we will get additional UltraBay Slim (SATA) ports, 4 USB 2.0, VGA,DisplayPort, Microphone in, Headphone out, Stereo Speakers, RJ-45 Ethernet, cable lock slot, and also charger for second battery. Near the docking station connector, we will find the memory slot, which is secured by two small screws. The battery slot is on the back, near the hinges. Net Screen Satisfied to observe all corners outside the notebook, now turn the inside. Slide the switch slider to open the notebook cover. Notice, above the display panel - the left and right sides - there is a small hook. This is the lock that keeps the LCD screen tightly closed when your notebook cover valve. There is nothing here. Do not search the Webcam. But the top left and right panel pan shows the parallelogram with the ultraconnect on the left side. Yes, in the right and left corner of the screen is the location of the built-in UltraConnect antenna that supports 802.11 a / b / g wireless connection and connects to the network controller in the ThinkPad MiniPC slot. In addition to the invisible antenna (because it is planted), what appears to be a large LCD panel. The LCD here measures 12.1 "with 1280x800 resolution support. The high resolution of the screen allows us to open two screens at once side by side comfortably in the LCD. The display screen looks sharp and bright. Black doff letters that surround the screen with LED backlight that makes us not be glare by the reflection when working with the light source is behind us. Just below the LCD panel, a row of nine LEDs. The LED will be bright green if what is indicated by it - such as a Wi-Fi connection - is on. The LED array, from left to right, represents Wi-Fi, Bluetooth, Num Lock, Caps Lock, hard drive access, power, battery, power supply and standby mode. On the left side of the Wi-Fi indicator LED shows a pair of vertical holes. Our conjecture - because this test unit comes without any completeness, other than the power cord and adapter - this hole is the internal microphone Keyboard Shortness Next, the eye will be pounded on the keyboard panel. Well, it's so crowded this panel; hardly any empty space except in the palmrest section, and a little space near the hinges between the ThinkVantage button and the on / off button. All the space from the left end to the right end is used to place all the keyboard keys. See how the Esc button until it must be docked with the left hinge. Meanwhile in the right hinge direction, starting from the last LED position, lined PrtSc, ScrLk, Pause, Insert, Home and PgUp buttons, also docked to the hinges. The Home and PgUp buttons also also serve as buttons to increase the screen contrast and - this is special - the button to turn on the light. Lamp? Yes there is a small light on the top panel of the screen, right in the middle, hidden in a triangular niche. Turn on the lights if you are going to use the notebook in a place with less light. This light emission fits illuminate the entire keyboard panel. When the lights are activated, on the LCD screen will appear green icon. The icon will be dropped when we disable the light feature by pressing (again) the Fn-PgUp key combination. Hmm, we go back to the top panel of the keyboard yuk. Between the Esc key and PrtSc et al, there is another row of buttons. Four of them are round, and one flat is elongated with a dark / purple blue. The rightmost button is the power button (on / off). While other buttons - except the flat button labeled ThinkVantage - is a shortcut to the volume function. Left round left button is the button to mute the volume. Next each button to shrink and raise the speaker volume. ThinkVantage ThinkVantage labeled flat button is typical of Lenovo. Pressing it means activating ThinkVantage Productivity Center. Here are links to Lenovo.live.com, and details about Access Connections, Active Protection System, Client Security Solutions, Rescue and Recovery, and System Update. What is required to learn is Rescue and Recovery, as it is a one-button solution that helps diagnose and recover systems from crashes or viruses, including when the main operating system is not booting. The keys on the ThinkPad X200 keyboard panel are wide and large. Soft and comfortable pressed-press, and not noisy. In short, it's fun to wear lingering typing. The Enter key is large, placed on the right side and colored purple blue. Lenovo's distinctive aura emerges from a rather rough little red button-trackpoint - flanked by the letters G, H, and B, as a substitute for the touchpad. As a trackpoint friend, in the bottom panel of the keyboard appears the right and left buttons, which is very soft and responsive. But to be honest - maybe because we are not used to using rigid trackpoints - we missed the presence of the touchpad. Oh yes, there is one feature on this keyboard. The keyboard here is spill resistant, aka not damaged when it hit the liquid spill. This is because the liquid will be streamed to the bottom of the notebook. That's why the bottom of the notebook 'fouled' by rubber pads. In addition to the right and left click button, palmrest available fingerprint reader (fingerprint reader). This can be used as a replacement or password booster when booting. 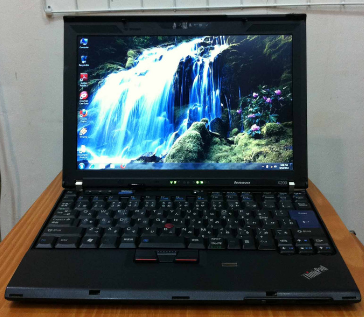 This ThinkPad X200 performance is powered by an Intel Core 2 Duo P8400 2.26GHz processor with 1GB memory support. This makes it powerful enough when running office tasks, as indicated by PC Mark scores reaching 2101 as well as Cinebench scores. But if judging from the results of its 3DMark 06 test scored 646 (see table), ThinkPad X200 will not qualified to play 3D games. But that's not the designation of the ThinkPad X200. This notebook is more intended as a business notebook to support the productivity of its owner. Perhaps also because of that, this notebook speakers sound less steady in our ears. The sound that comes out of the speakers is less powerful, when the volume has been jacked up to the maximum. Can be placed at the bottom of the notebook also affect the sound quality of speakers. One good thing here, ThinkPad X200 is not noisy and cold when operating. The owl style fan design - so called Lenovo - apparently works well in minimizing sound and heat. Whereas the ventilation / ventilation hole is only on the left side of the unit. The Lenovo battery bundles the Li-Ion battery pack with a rating of 14.4V 28.8WH on the ThinkPad X200. Physical thin batteries widen, and lightly. In our test - play high definition video - the battery lasted 1 hour 8 minutes - not too special. While the Battery Eater 05 test program recorded lower resistance, in the third quarter range. When the battery power is low, we will be offered Battery Stretch to extend battery life. This is basically a setting setting - Display, Wireless radio and volume. For display settings, options are available to minimize the display brightness, turn off the display after 30 seconds of inactivity, minimize display refresh rate, reduce video color quality, and hide Windows Sidebar. *** As a business notebook, Lenovo ThinkPad X200 is already prepared to face the heavy field. But the weight is not too burdensome: 1.408kg following battery, plus 364gram for adapter and power cable. Meanwhile the physical size fits. The performance of the ThinkPad X61 successor notebook is qualified for standard office tasks, browsing the Internet or simply enjoying movie clips. In our test notebook, there is no visible optical drive or Webcam. But according to Lenovo Indonesia, which is sold at a price of US $ 1599 now includes an external multidrive DVD. In addition, Webcam was installed in the notebook, plus 6-cell battery packs, and type Intel Core 2 Duo P8600 processor. PLUS: Keyboard is very convenient; spill-resistant keyboard; bright screen; ThinkPad Vantage button; lamp. MINUS: Without optical drive; without touchpad; quality speakers; 3-foot power cord TEST RESULTS Compared Toshiba Satellite M300-E413, performance - except for graphics - Lenovo ThinkPad X200 is more or less equivalent. This notebook is quite capable and reliable serving tasks related to the office, but not for 3D graphics. If only the battery capacity could be greater.